Holy moly, Facebook is again at the center of a new privacy controversy after revealing today that its platform mistakenly kept a copy of passwords for “hundreds of millions” users in plaintext. What’s more? Not just Facebook, Instagram users are also affected by the latest security incident. So, if you are one of the affected users, your Facebook or Instagram password was readable to some of the Facebook engineers who have internal access to the servers and the database. Though the social media company did not mention exactly what component or application on its website had the programmatic error that caused the issue, it did reveal that the company discovered the security blunder in January this year during a routine security check. In a blog post published today, Facebook’s vice president of engineering Pedro Canahuati said an internal investigation of the incident found no evidence of any Facebook employee abusing those passwords. “To be clear, these passwords were never visible to anyone outside of Facebook, and we have found no evidence to date that anyone internally abused or improperly accessed them,” Canahuati said. Facebook has now fixed this issue and recommended users to change their Facebook and Instagram passwords immediately. Besides this, all Facebook and Instagram users are always highly recommended to enable two-factor authentication, login alert feature, use a secure VPN software, password manager, and physical security keys to protect their accounts from various type of sophisticated cyber attacks. This is yet another security incident for Facebook. In October last year, Facebook announced its worst-ever security breach that allowed hackers to successfully steal secret access tokens and access personal information from 29 million Facebook accounts. 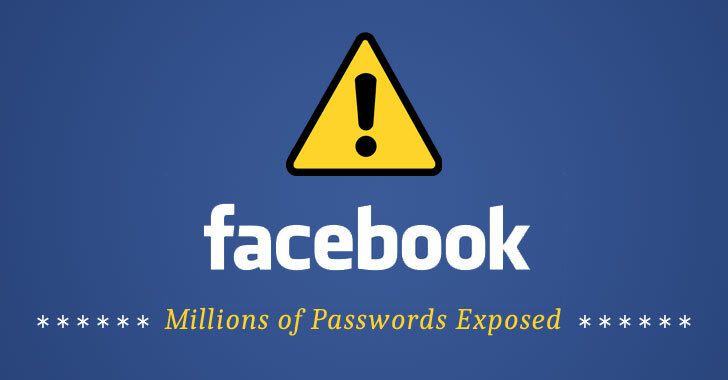 However, Facebook is not alone that exposed hundreds of millions of its users’ passwords in plain text. Twitter last year also addressed a similar security incident that unintentionally exposed passwords for its 330 million users in readable text on its internal computer system.